How does 15,000 new gifts for the holidays sound? Much like great holiday gifts, the approximately 15,000 new species discovered around the world every year can be surprising, extraordinary and sometimes down-right odd (like this a crab that grows its own food). And while we already know about an incredible 1.2 million species, experts suspect the vast majority of the world’s species - 86 percent on land and 91 percent in the oceans- are still awaiting discovery. Yet growing pressure on fragile land and marine habitat is causing unprecedented species loss. To ensure we don’t lose some of nature’s greatest gifts, it’s critical to protect and restore areas that are rich in biodiversity, especially our forests. 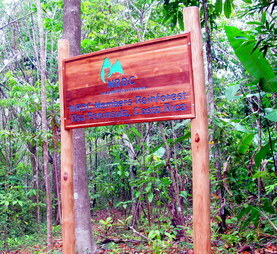 In Costa Rica, NRDC is doing just that with the help of our members. Through our Revive a Rainforest project, we’re working with local partners to restore critical tropical rainforest habitat in the Osa Peninsula, Costa Rica’s biodiversity crown jewel. From the evergreen crown of the Canadian boreal to the lush and rainy tropics, forests shelter the vast majority of the world’s land species. Tropical rainforests are particularly rich - covering just about two percent of the Earth’s surface they’re home to an estimated 50 percent of all plant and animal species. Sadly, deforestation and other threats are wiping out the world’s forests at an alarming rate. Every year some 13.5 million acres of forestland is lost - roughly the size of New York State. As these forests disappear we’re losing up to 100 species per day, many of which we may not even know about yet. Under growing pressure from expanding unsustainable agriculture and poorly planned development, the unique biodiversity of small, isolated places like Costa Rica’s Osa Peninsula is at particular risk. At less than half the size of Rhode Island, the Osa is home to roughly half of Costa Rica’s 500,000 plant and animal species - it’s nearly unheard of for such a small place to have such a high concentration of species. Yet the fact that it’s so small means that if the Osa’s forests are lost or irreparably degraded, this biodiversity simply has nowhere else to go. This is why NRDC has partnered with the group Osa Conservation and aims to plant 25,000 native trees on part of their property - helping to bring back vibrant plant and animal biodiversity to land that was cleared years ago for cattle ranching and later used for exotic species plantations. Our partners have spent long hours walking through healthy forests to identify and gather seeds from the native tree species that will help accelerate forest and wildlife recovery. Since the first planting season last year, Osa Conservation has added an additional 19 species to its nursery, for a total of 72 types of native trees. Some of these species are so rare; they may never have been cultivated before. Knowing that natural seed dispersers and pollinators such as birds and bats also play an important role in forest recovery, Osa Conservation’s experts have carefully selected tree species that will help attract these animals. The fragrant white flowers of the Palo Verde, or Ceiba tree, will attract bats and moths at night; and during the day parakeets and parrots will feed on their cottony seeds. The Osa’s forests are a haven for 463 species of birds including both migratory birds and endemic species such as the elusive Yellow-Billed Cotinga, of which as few as 250 remain. Osa Conservation’s experts are monitoring birdlife in the “NRDC Member Rainforest” and have already observed 61 species including migratory song-birds from North America like the brightly colored Yellow warbler and Summer tanager. Our partners have also set up bird and bat boxes to recreate the tree hollows that normally serve as nests in a healthy forest. During the course of the year the scientist monitoring the boxes found that birds and a colony of at least ten bats were already using the boxes as nests. They also found evidence of clever small mammals that - not to be outdone by the birds and bats - had also moved into spare boxes. Apart from its lively birdlife, the Osa is also home to 140 species of mammals, notably white-lipped peccaries, ocelots, jaguars, and all four of Costa Rica’s monkeys, including Squirrel monkeys – the smallest and rarest primate in Costa Rica. As the forest we are helping to restore continues to recover, it will attract more and more of these incredible and threatened animals. A decade ago, peccaries were few and far between in the Osa as they struggled against poachers and the loss of their forest habitat. Encouragingly, their populations are rebounding. Herds now noisily trample through Osa Conservation’s property – a haven from poachers – searching out palm nuts to crack open, fruits, roots and other food. As the roving herds of peccaries move through a forest they churn up the soil, scatter seeds and even help clear underbrush, all of which helps the forest recover even faster. Eventually we hope that jaguars and other large cats that rely on peccaries as part of their diet will also follow. 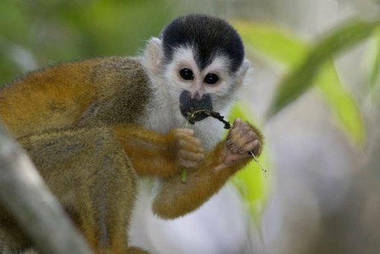 (For pictures of the Osa’s spectacular wildlife visit Osa Conservation’s photo gallery, here). Earlier this year an NRDC group travelled to the Osa to meet with our partners about some of the threats facing the region. While there, we saw firsthand the difference between degraded lands - where native trees struggle to compete against exotic species from abandoned plantations - and pristine forests where the multitude of tree species brings a cacophony of bird and monkey calls. Our partners explained how intimately tied the forest’s biodiversity is, describing how the return of one species – be it a fruit tree monkeys seek out, or the peccaries that jaguars need to thrive – can have a far-reaching impact on the health of the entire forest. We also tried our hand at tree-planting. It’s incredible to know that thanks to our members the small seedlings we planted in the NRDC Member Rainforest that day will help protect and restore the region’s fragile habitat– ensuring that over the years we can keep on enjoying and, indeed, discovering the Osa’s vibrant and unique biodiversity.